There is no doubt that videos drive sales – out of 96% of B2B companies that use videos in their marketing campaigns, 73% of them have reported a better ROI. Moreover, 92% of B2B customers watch videos online, and 43% of those actively search for videos while researching products or services for their own business. 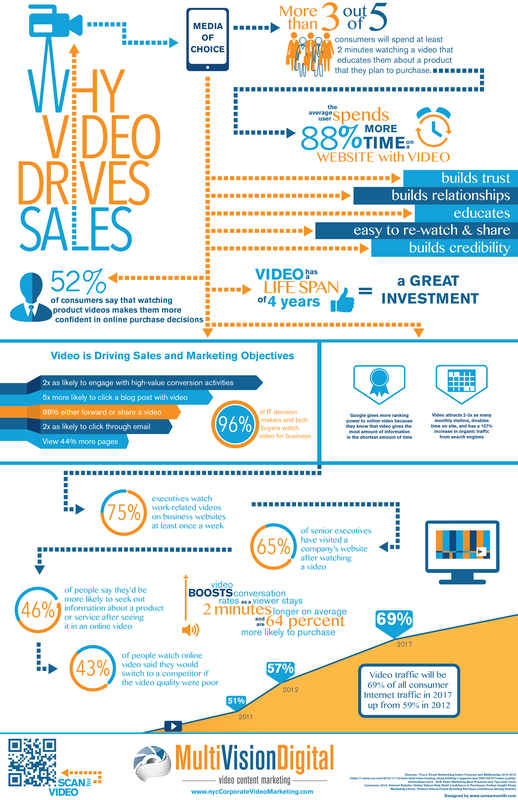 In spite of these numbers, many B2B marketers fail to align their video marketing efforts with sales results. They produce videos that don’t connect with their customers and don’t positively impact sales. Ideally, you want to create engaging video content that triggers emotions. You also need to include a clear Call To Action (CTA) to urge viewers to take the necessary steps to learn more about your brand and the services you provide. While creating this type of content isn’t always easy, we have three tips that can help you refine your video marketing strategy and ultimately increase conversions. Shorter videos (less than 15 seconds long) are watched and shared more often. Users respond well to videos that are funny and emotional because it’s easy to connect with them. A CTA should be included with every video in order to drive sales. Optimizing videos makes it easy for prospective customers to find your brand. Lego adds small 15 second videos to its Instagram account and provides links to the complete videos in the descriptions. This allows the company to retain the attention of their Instagram followers, while also providing a CTA for users who would like to see more. With attention spans decreasing, this strategy makes total sense, and the facts only serve to strengthen the case. Videos that are 15 seconds or shorter are shared 37% more than those that are 30–60 seconds long. After the first minute, 5% of viewers stop watching a video, and 60% of the remainder stop watching after two minutes. Thankfully, there are lots of ways you can integrate short videos into your marketing strategy and plenty of tools to get you started. Also, you don’t have to worry about spending a ton of money on creating professional videos as there are some simple ways to avoid an amateurish production without denting your wallet. Videos like this one help create an emotional connection and encourage loyalty from customers. In fact, 71% of users who see a personal value in a B2B product end up buying it. Moreover, according to studies, using powerful emotional triggers (negative or positive) in videos can lead to them being shared twice as often as others. Adding a pinch of humor is one way to foster an emotional connection, while also humanizing your voice and inspiring trust. While there is no shortage of resources to help guide you on your quest to connect emotionally with your target audience, the success of this tactic will depend on how well you know yours. Looking to your specific buyer personas and asking yourself what drives them is a good place to start. Without that CTA, this video would have just been about a man who made his first move with Squarespace. However, with it, the viewer is urged to make their own move and create a Squarespace account. Include your CTA in the actual video, for example, by saying it aloud. For YouTube videos, you can add annotations that include your CTA. For Instagram and Facebook videos, CTAs can be added to the description boxes. Instead of just posting videos on YouTube, companies like Evernote also write a description (including a CTA), meta description, and other details, including keywords where appropriate. Thanks to all these details, it becomes easier for the video to rank higher in search results, when a user searches for “Evernote iOS” or other related keywords. 76% of marketers plan to use YouTube in their video marketing strategy, and rightly so. This platform processes over three billion searches a month, and can help you reach potential customers who know what they want, but don’t know about your brand. By optimizing videos correctly, you can help them climb to the top of search results for various keywords. To maximize the potential reach of your YouTube videos, you need to first map out which keywords your target audience might be searching for, and then optimize accordingly. The truth is consumers love videos, and by the end of 2017, video content is tipped to represent 74% of total internet traffic. With customers four times more likely to watch a video of a product than read about it, incorporating videos into B2B marketing strategies has become more important than ever. It is one thing for a B2B company to create videos, and a whole other story when it comes to producing impactful videos that can help increase sales. If you are not careful with your marketing strategy, you could end up wasting both time and money. Produce shorter videos to get more views. Create funny and emotional videos to connect with your audience. End the video with a strong and efficient CTA. Make sure your videos are easy to find. Do you have any questions about creating videos as a part of your B2B marketing strategy? Let us know in the comments section below!